Browse several charming shops offering high quality hiking and ski gear, as well as souvenir items and collectibles. A variety of area shops are also prepared with grocery items and sundries to make your stay a comfortable one. 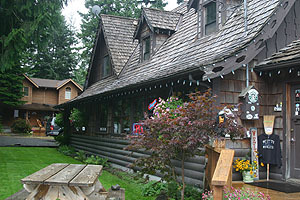 The Mountain Shop is located at Crystal Mountain’s base area. It is just steps from the bottom of the mt. Rainier Gondola and carries all your “mountain needs” and more. Shop a wide selection of clothing, accessories, hiking boots, sunscreen, jewelry, gifts, postcards, dog necessities, art and more. The Mountain Shop also sells gondola tickets so it is truly your one-stop-shop. Shop a great selection of Mt. Rainier books for both kids and adults at this sweet gift shop. Browse the collection of stuffed animals, t-shirts and fleeces. Also find an assortment of grocery items along with many different microbrews and Washington wines. Hats from Wapiti Woolies have made it all over the world — including to the top of Mt. Everest! This family-owned business is well-known for its exceptional hand-crafted hats. Each one is made with the finest 100% pure virgin wool and lined with polar fleece to prevent itching and sized to provide maximum comfort. Enjoy browsing their wide selection of ski accessories, high quality outerwear, t-shirts and gifts. Sip on a Starbucks brew while you shop. Enjoy free Wifi. Inside the historic Sunrise Day Lodge at Mt. Rainier, find one of a kind gift items, books, collectibles and a wide assortment of Mt. Rainier National Park keepsakes. Find gas (only gas within 35 miles of Crystal Mountain), camping and fishing gear, sundries, health care items, wine, beer and groceries. Get your fishing and hunting licenses or purchase a national forest pass. Laundry facilities are also available. The best selection of sasquatch gear around… Also find camping gear and hiking equipment, outerwear, local artists’ wares and gifts. A deli also serves espresso and ice cream. Enjoy free Wifi.